You are here: Home / Educational Resources / Research Articles / Has Your Stamp Been Regummed? Has Your Stamp Been Regummed? Without question, the most valuable commodity in our hobby today is gum. If you do not believe this, just compare auction realizations where similar copies of a stamp may vary in price as much as five or six times depending on the state of the gum on each. Centering and freshness also playa part in determining value, but gum condition seems to be the most important factor in actual pricing. Gum is also the most misunderstood aspect of our hobby. The term “original gum” is used universally by dealers and collectors alike. It refers to the adhesive on the back of a postage stamp, intended to attach the stamp to a letter or parcel when moistened. On an unused stamp, when this gum remains the stamp is described as having original gum. The optimum condition for this gum is to be in exactly the same state as it was in when it left the post office. This is referred to as “mint, never hinged”. The small, gummed paper hinges that were popular in the earlier days of our hobby – before protective mounts – were clean, usually easily removed, and left only a light outline on the gum where they had been attached. Today people are quite willing to pay a premium for “never hinged”, although few know why. Actually, paying extra for never hinged stamps was a practice started by individuals who did not know very much about stamps. They were trying to protect themselves from buying damaged or repaired stamps so they insisted upon “never hinged”. The fact that most early issues no longer exist in this condition has never impeded these individuals in their search. And, of course, where someone is willing to pay extra for something, that something is always made available by some of the shadier characters in our hobby. Now, it is true that it is difficult to sell stamps where remnants of previous hinges are present. Because of this, removal of old hinge traces has become an art rivaling gem-cutting. Surgical and dental tools are used by highly skilled artists to remove old hinge remnants. The logic of this is that nothing should be hidden by hinges still attached to the stamp. To make the removal job easier, the stamp is put into a very damp environment where the gum on the stamp is actually liquefied, that is, made completely liquid or melted, just as it was when first applied. Hinge remnants can then be lifted right off the stamp without damaging it. By taking a fine brush and redistributing the remaining gum, the traces of previous hinging can be hidden from all but the most expert eye. The gum here is most certainly original – nothing has been added – but the state of the gum is most definitely changed from its original condition. This change occurred as the gum re-dried. While what remains is original, the gum is thinner due to some having been removed during the brushing process. Also, the environment where it dried after hinge removal is entirely different from that following its original application. Certain changes in the appearance of the gum also result. filled in or erased when original gum is redistributed. It becomes important to know typical gum for any particular issue of stamps. Figure 1 illustrates the typical gum on the 1893 Columbian issue. Note the long streaky gum skips running horizontally. The upper portion of the picture shows the outline where a hinge was removed. A close examination shows that all traces of gum skips have been erased where the hinge was, while the normal skips show everywhere else. Figure 2 shows the typical gum found on the Trans-Mississippi or early Twentieth Century issues. While the gum here is thinner and smoother, a very close examination shows fine streaks in the gum elongated vertically. The reader can easily see where a hinge was removed. The original gum has been seriously affected, and it no longer resembles the gum around it. 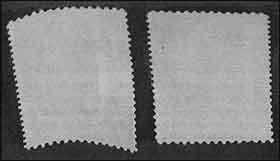 Additionally, one often finds the light outline of perforations impressed in the gum on these later issues, probably as a result of sheets being placed one upon another when they were perforated and while the original gum was still damp. These faint perforation traces are very helpful in determining if the gum is original. The process of gum redistribution will either erase these perf traces or make them far less visible to the naked eye. The fine row of horizontal perforation traces in this example has been completely eliminated where the hinge was removed. These two examples should help the reader to understand better original gum and its characteristics. We can now discuss those changes resulting from the melting of gum to remove hinge remnants. 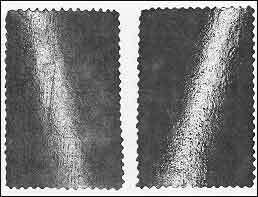 When gum is dried too quickly after the redistribution of the original gum, it will crackle all over (see Figure 3). 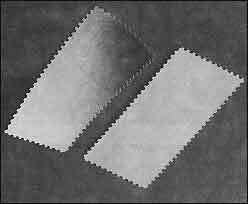 If dried too slowly, the moist gum will run into the broken paper fibers around the perforations and their teeth as shown in Figure 4. 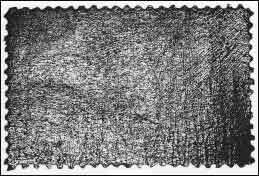 The stained areas around most of the perforations on this stamp were caused by dampened original gum running into the body of the paper through these broken fibers. 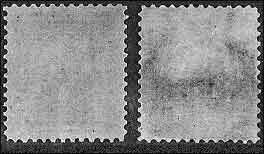 Reproducing the same conditions under which original gum was applied and dried onto stamps is virtually impossible. Therefore, almost all stamps with redistributed original gum have gum which does not match the normal gum for that issue. A simple comparison copy is all that is needed to detect gum alteration. It seems obvious that a stamp with good original gum can be used as a control copy against which all possible acquisitions can be compared. This writer would recommend the purchase of a fresh copy of a low value of a set having both a straight edge and a hinge remnant attached. This type of stamp has little value as a collectible, but will serve as a very valuable comparison tool so long as the original gum is fresh. The important thing to remember is that the same gum was applied to the 1 cent Columbian as to the $4 or $5 of that issue. The inexpensive stamp, therefore, can prove to be very valuable in the long run. Up to now we have avoided the word “regummed”. Most of the stamps that the collector will encounter will not be regummed. But some will be, and the collector should know enough to protect himself. There is often little difference between a stamp with redistributed original gum and one that has been regummed. This is not unusual as the basic processes differ very little. A stamp having hinge remnants removed may have additional gum added to the liquefied original gum. If the job is done well, it may be extremely difficult to tell, even for an expert. Fortunately, most are not so difficult. Stamps almost always are regummed to hide defects. A tear in the paper can be closed and the repair substantially hidden under a good coat of gum. There may be evidence showing faintly on the face of the stamp, but it will be almost impossible to see this type of repair through the gum. Another repair that is often hidden under regumming is the addition of a new margin. Probably the most commonly hidden fault is a thin spot. Thin spots are shallow depressions in the paper caused by the improper removal of something attached to the gum. This might be a hinge, an album page, or anything else to which the stamp got stuck. Some thins are tiny and are easily covered over with new gum. This type of repair may be very difficult to find, even in watermark fluid. Other thin spots could be large or deep. 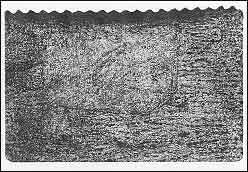 This type cannot be covered with new gum as it will still appear when the stamp is immersed in fluid. The repairer will often try to fill in this type of thin spot with a foreign substance, usually in a paste form. New gum is then applied over the repair. The stamp on the right in Figure 5 has been repaired extensively. Large thinning from the center of the stamp to the top has been filled in and covered over with new gum. The stamp on the left shows the normal gum for that issue. A close examination shows how very different the two stamps appear. Regumming is nothing new. It has been with the hobby since the 1860’s or early 1870’s. The only change has been in the methods used. Each method leaves its own evidence, almost a signature. So let’s examine a few. The latest development in painting has been applied to regumming: the spray gun. 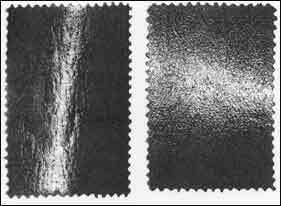 Spraying requires air, and air dries, leaving bubbles as shown on the right stamp in Figure 6. Sprayed gum also appears much more shiny than the normal gum of the issue, compared at left. These bubbles can be brushed away, however, so be careful. A close examination should reveal enough differences to make the examiner suspicious. The Graf Zeppelin issue of the United States is an odd-sized stamp and is very prone to gum wrinkles, gum bends, or gum creases. Gum creases can lead to actual creases in the paper if mishandled. 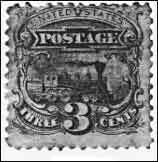 Figure 7 shows two stamps from this issue. The stamp at right shows traces of a diagonal crease at the left. Only traces show, though, as the stamp has been regummed to remove the crease. Normal gum for this issue is on the stamp at left. While this stamp has been “de-hinged”, the regummed stamp has an entirely different gum. This stamp was regummed by melting the gum and adding additional gum over the original gum already on the stamp. While this was done as well as could be, the new gum was dried too quickly and has the wrong appearance for this issue. Certain characteristics of gum, both original and new, are very helpful to know when examining gum. Original gum will often have color offset ink traces showing on the gum. This is due to the newly printed sheets being stacked on top of one another while the ink was still wet. If there are offset ink spots on the stamp and they are under the gum, one can be pretty sure that the gum is not original or has been tampered with. Offset on top of the gum would indicate that the gum is original. Another thing to look for when examining gum is foreign matter embedded within the gum itself. Most of the regum jobs are done by brushing new gum onto the stamp. Brushes lose hairs, so look for them! Multi-colored gum is another indication of gum manipulation. If the gum has more than one color in it, the gum cannot be original unless it has been redistributed. 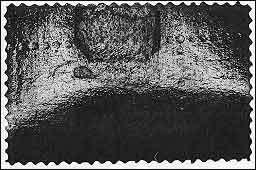 One additional factor in detecting gum alteration is the “curl” of a stamp. 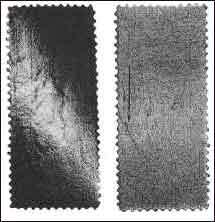 This curl can be caused by the weave of the paper fibers, created during the manufacture of the paper, or it can be caused by the contracting of the gum applied to the stamp. All stamps have a curl natural to the issue. Figure 9 shows a hinged o.g. stamp at left with the proper curl for the issue, while the stamp at right curls in the opposite direction. This stamp must be regummed as all original gum was applied in a similar manner, making different curls impossible. The hinged stamp was gummed from side to side, while the regummed stamp was gummed top to bottom. The collector can use these points to protect himself from the more obviously regummed stamps. When in doubt, a certificate from a recognized Expert Committee should be obtained. Regumming is something to be aware of, but certainly not to fear. As in all aspects of our hobby, knowledge is the best protection.